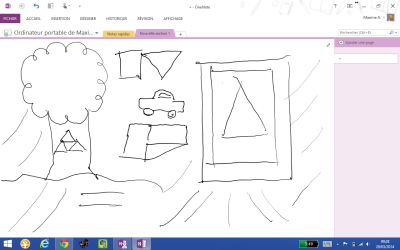 Like some people, I chose to wait before purchasing my own touch-enabled tablet. Either being the first iPad from Apple back in 2010, or the following Android tablets (Samsung Galaxy Tab, Asus Transformer, Google Nexus...), I never felt I actually needed one. I first started to be interested by such consumer products back in 2013, when the first Windows x86-powered tablets, like the Surface Pro, started to be released. I, thus, started to consider a tablet as a good way to access my usual Windows applications on a smaller format device, without any software restriction. 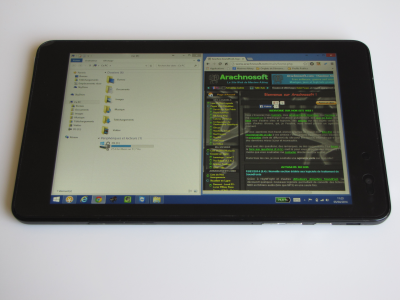 My interest grew quickly when, back in June 2013, the very first 8" x86 tablet was announced: the Acer Iconia W3-810. But my initial enjoyment quickly vanished as soon as I read the first review, stating that this tablet came with a mediocre TN screen! Hopefully, three months later, new tablets sporting the brand-new Bay Trail platform from Intel revamped my interest: first was the Iconia W4-820, a W3 updated with an IPS screen (at least! ), quickly followed by those from other manufacturers: Dell Venue 8 Pro, Toshiba Encore WT8, Lenovo Miix 2 8", Lenovo ThinkPad 8 and Asus VivoTab Note 8. 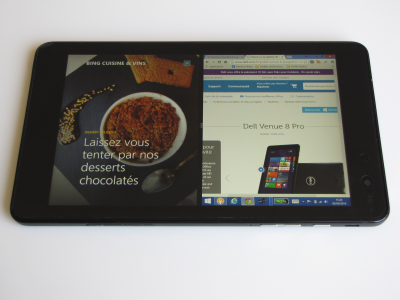 Why choosing the Dell Venue 8 Pro? After having spent several months reading numerous reviews, comparative tests and miscellaneous user feedback reports, I synthesized everything under an Excel spreadsheet to compare each feature. 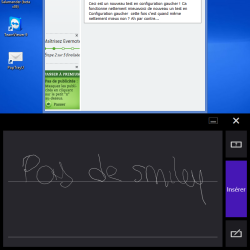 Which led me to choose the Dell Venue 8 Pro, because it was the only one carrying both HSPA+ and stylus support, while being also one of the very few available in France. Now convinced, and despite the lack of HDMI video output, I ordered a 64 GB + HSPA+ Dell Venue 8 Pro with stylus in March 2014, directly from Dell, and received it 15 days later. 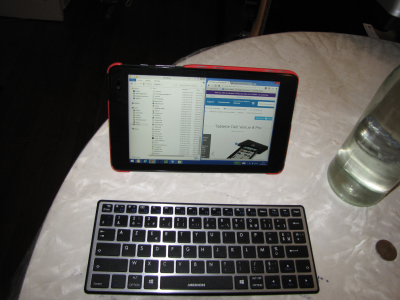 I'm thus going to give my own feedback on this tablet, after testing it extensively for more than two weeks. Some points I'll thus try to cover more extensively. 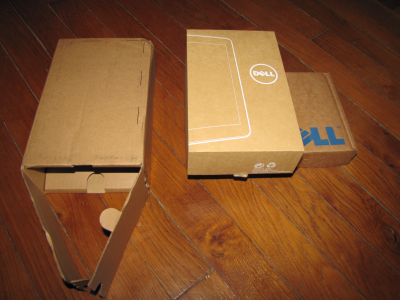 This tablet ships in a dual carton box, the external one protecting the inside from shocks during shipping. the tab is wrapped up within a transparent plastic, protecting the screen and body shell from scratches during initial conditioning. this plastic layer doesn't prevent using the tablet, either being with your fingers or stylus. 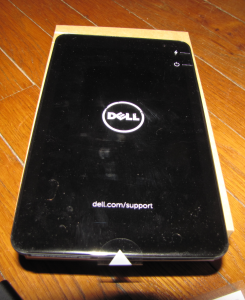 If you can live with the Dell logo and website URL on it, you can perfectly use the tablet with this protection at first, while waiting for a screen protector or cover, for example. 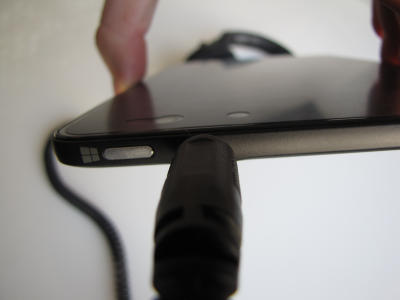 The tab can be powered on immediately after being unboxed, but its battery not being fully charged when leaving the factory, you must plug the AC adapter just after receiving it, to preserve battery's health. The USB port needed to charge being covered by the plastic layer mentioned above, you'll have to remove it to connect the cable, or, if you choose to keep it temporarily, make a very gentle cut around the connector to access it. Once the plastic layer has been removed, you're ending with a very elegant tablet, with a nice build quality, even more if you consider its $299 price tag: everything seems well-built, the back isn't "crackling" or bending when you push on it, just like the screen. The entirely-black, logo-free front side, leads to a very serious-looking and discrete product. So discrete, that you'll often find yourself holding the tablet in the wrong orientation, such as with the camera on the bottom while holding it in Portrait mode! Hopefully, this has absolutely no effect on the tablet's operation, as the display rotates automatically depending of the orientation you're using, except in Photo mode, of course. The back is being covered with textured material, with very subtle circle shapes. I own the black version of this tab; there's another red color available on other markets, which seems to carry the same shapes according to photos you can find on the Internet. This material seems, moreover, quite scratch and shock-resistant, even if, obviously, it's likely to show some scratches and usage defects over time, if you're not particularly careful while handling it, or if you don't protect it with a smart cover. The rubber-like, circle-shaped cover really help with holding the tablet, avoiding it being slippery in your hands. This body shell, with rounded corners, feels warm in the hands, an opposite sensation to what you could experiment with an aluminum iPad, with its sharp edges, cold and smooth touch material, which prevent, in my opinion, any slippery-free sensation. The Venue 8 Pro is 21.59 cm tall, 12.95 cm large and 0.89 cm thick (8.5 x 5.1 x 0.35 inches). This shape leads to a very nice product for all those looking to an intermediate product to fill the gap between their cellphone and laptop computer, without having to swap either one for a larger-screen smartphone (phablet) or smaller laptop (ultraportable, ultrabook, netbook...). That said, you should not expect fitting this tablet into all pockets! Unless wearing rather large clothes, it's still significantly larger than a 7-inch tablet like the Google Nexus 7, which is already too big to fit some pockets. You'll usually prefer carrying this tablet into a suitable bag, just as 10" or lower netbook cases. Its 396 g/13.97 oz weight, even without breaking the record set by an iPad Mini, leads to a very portable device, easy to hold with one single hand without strain. 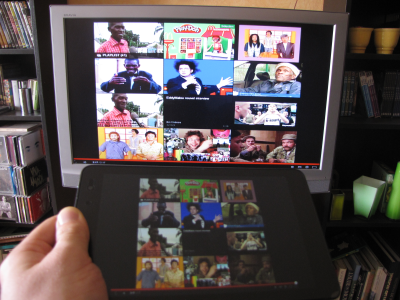 The difference with a 10-inch tablet is very noticeable. 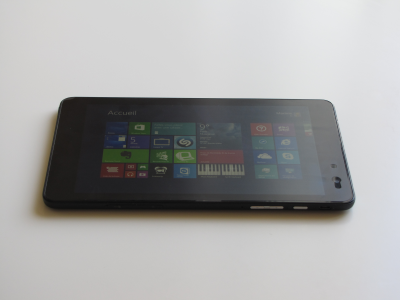 The Dell Venue 8 Pro comes with a full Windows 8.1 operating system. 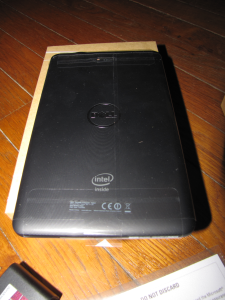 It should not be confused with the older, "non-Pro" Dell Venue 8 tablet, which is powered by the Android operating system. the other one, named "Classic Windows" or "Classic Windows Desktop", is identical to the one you have on Windows 7, inherited back from Windows 95. 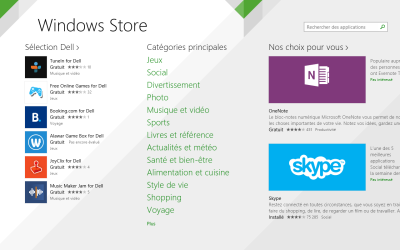 Applications designed for Windows 8 and Modern UI can be downloaded from the Windows Store, while the others can be downloaded either from the same Store, or from any other source. 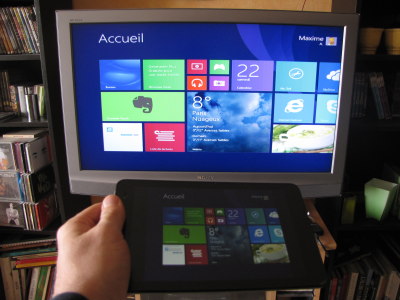 Unlike Windows RT, designed for ARM processors (like those found on smartphones or small computers like the Raspberry Pi), Windows 8 can run the very same applications than your desktop PC, on a tablet. Which means that it can run all 32-bit applications made for x86 processor architectures, which were first made available by Intel and its 8086 back in.. 1978! This dual user interface can sometimes lead to some confusion, and you'll often find yourself switching from one to the other, depending of the application you'll want to use. 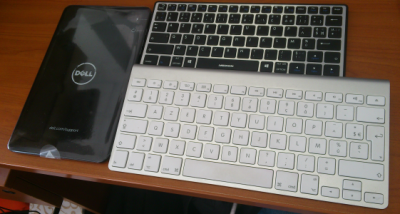 That's why I'll cover the use of the Venue 8 Pro with both interfaces. You'll notice, at least, that you can even get access to all Android applications on your Windows tablet, thanks to App Player by BlueStacks, which, while still in beta, can already give access to all your favorite Android applications and games! 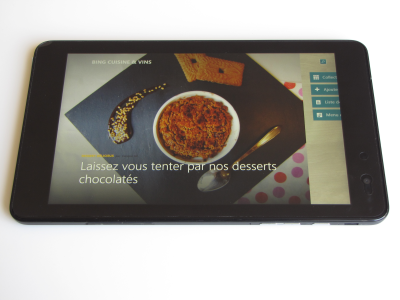 The highly-contrasted and bright screen of the Dell Venue 8 Pro enlightens Windows 8's home screen, and its famous colored tiles: the rendering on screen is very sharp, with smooth fonts, and so are fullscreen images from some applications like Bing Food & Drink. The display defaults to three rows of tiles (or three columns in Portrait mode), which can sound rather pessimistic on a 800-pixel height (or width in Portrait mode) screen: it seems that there would be enough space to fit an additional 4th row of tiles, but it seems that Microsoft didn't choose this path, because, even with the "Show more tiles" option available on the Settings > Home Screen tiles menu, it leads to 4 rows of tiles... within roughly the same space! You can workaround these choices, and tuneup the number and size of the tiles you're showing on the screen, by tweaking some settings on the Windows Registry, or more easily, by using an application like Metro Scaler. 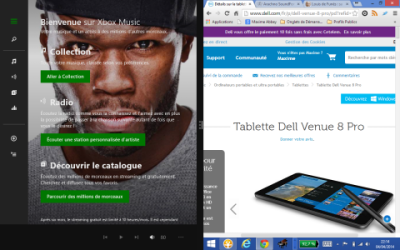 The overall Windows 8 experience, which often seems rather imperfect on a non-touch enabled PC, feels great on tablet devices, and most of the "gestures" soon become intuitive: scrolling with the finger from the left side swaps from an application to another, a swipe from the top border closes the active application, and a swipe from the bottom leads to the application's contextual menu, similar to what you'd expect using the "Menu" button on an Android device. At least, a swipe with the finger from the right-hand side of the screen gives access to the famous "Charms bar", which offers search features, links to devices and main system settings, replacing, most of the time, the classical Start menu, except to access all the installed applications, which you can reach by scrolling the tiles from the Home screen to the top. The 1280x800 pixel resolution on a 8-inch screen gives a "dot-per-inch" ratio of 188. All the elements displayed on the Windows Desktop thus appear rather small: it's an equivalent of a 1920x1200 pixel resolution on a 12" screen, or 3840x2400 pixel resolution on a 24"! Granted, if you compare this pixel density with those provided by recent smartphones, such as the HTC One (468 DPI, 1920x1080 pixel 4,7" screen) or Google/LG Nexus 5 (445 DPI, 1920x1080 pixel 4,95" screen), a 188 DPI density would appear rather weak. But you have to think that, unlike smartphone operating systems (Apple iOS, Android, Windows Phone), the Windows Classical Desktop isn't made (yet) to automatically scale the fonts of its applications according to the pixel density offered by the screen. 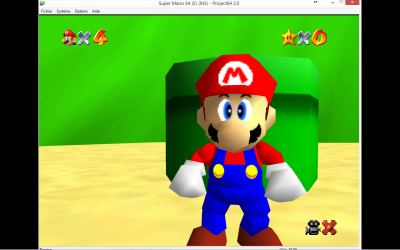 As a result, on the Venue 8 Pro, and any other Windows 8.1 device displaying the classical Windows desktop, there's no automatic upscaling, and each element is being rendered in its native, original size. Which leads to some difficulties when you have to use the desktop on such a small screen, such as selecting very small elements with the finger, like the ">" icon of the Windows Explorer to expand a folder, or the arrow icon located near the taskbar's icon notification area (system tray) to unveil all hidden icons. if you're mainly using applications from the Windows Store, made for the new Windows Modern UI interface (previously known as "Metro"), you'll not have to worry about this fact, as, just like on Windows Phone, these applications have been designed to scale their display (font size, images) according to the screen's pixel density: the elements will still appear at the same size, only using more pixels to sharpen the display and make it look "smoother". This button works just like any other you'd find on a PC, and allows to power on the tablet, enter in or wake it up from sleep mode, and power it off completely in case it'd be stuck, by pressing the button during a longer time. Just like on a classical PC, you can adjust the behavior of all actions associated with this button, from the BIOS or Windows power settings. This dual button allows you to raise up or lower the output volume from the integrated speaker or jack output. Just like a PC, or any other Android, Windows or iOS tablet, these buttons can be reassigned to do other tasks by some applications. A frequently used shortcut would be, for example, Windows + Volume Down, which triggers the screenshot function. Unlike most other tablets, Dell made the decision to relocate the Windows button (giving access to the identical-named menu) on a tablet side, and not on the front side, under the screen, where you'd usually expect it. This choice, rather disturbing at first, wins points when it comes to avoid accidental triggers when holding the tablet through the sides; the (logical) side-effect being that it'll be more difficult to find and trigger it instinctively, even more if you're already used to another tablet. More than its side position, which I find rather good to avoid unwanted triggers, I'd rather criticize its location near the headphones jack; it'll be even more difficult to reach when headphones will be plugged in. Moreover, it leads to confusion with the other physical buttons group located nearby (the Power On/Off button, not to mention it), even more when you're still learning how to use this tablet, although all buttons aren't located on the same side. I'd have preferred to find this button on any other three remaining sides, which don't carry any other connector and sensor willing to interfere with it. That said, this sounds like a minor drawback to me, and should not lead you to buy another tablet just for this reason. The micro-USB 2.0 port seems well built at first, no weakness to exhibit towards build quality. However, it'll have to be manipulated carefully, and you'll have to avoid filling it with heavy cables, because it's the only port of its kind and, moreover, the only way you have to recharge the tablet. And here comes the first really annoyance of this tablet: lacking another USB port, separate power input or induction-charging technology, you'll not be able to use a USB device on this tablet while charging, unless relying on a combination of several cables and adapters. It's even more frustrating if you consider that there was enough room on the other sides of the tablet to host several other connectors; that said, all other current 8 inch Bay Trail tablets suffer from this limitation, leading me to think that it may be a(n) (intended?) 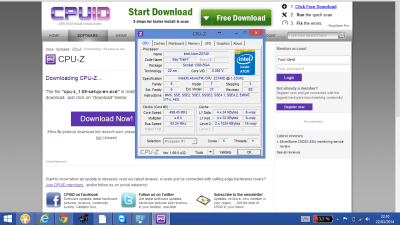 limitation of Intel's platform. Other limitation worth mentioning: it seems that this tablet can't power a 2,5" HDD hosted in an external enclosure using this single USB port, the tablet being unable to fulfill the disk's power requirements with those from the enclosure, although it might work with a very low energy-consuming disk. Of course, you'll not encounter this limitation with separately-powered and low-powered devices, such as USB flash drives. I'll also mention the fact that Dell doesn't supply any OTG ("On The Go") cable out of the box, to connect a standard USB device on this port. You'll have to buy it separately. Protected by a cache (shared with the micro-SIM port), this port can host a flash memory card in microSD, microSDHC or microSDXC formats to expand the internal memory's storage capacity. Dell indicates that this port supports up to 64 GB cards, but as long as the card remains compliant with the SDXC standard, higher capacities should work as well. 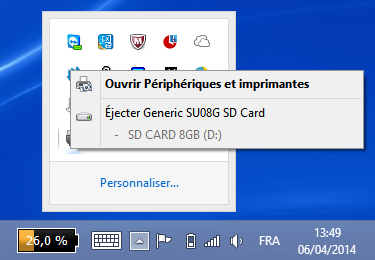 The card inserted into this port is automatically recognized as a separate drive under Windows, on which you'll then be able to install applications, but remember that a SD card is often much slower and prone to wear-and-tear, than the integrated eMMC flash memory used by the Venue 8 Pro. You'll thus prefer to use this SD card port as a storage unit, to preserve the card's health. This port allows you to host a micro SIM card, same as the one you'd find on a smartphone, so that you can use your cellphone's data plan to access Internet in areas with no Wi-Fi coverage, just like you'd do with your smartphone. This connector is optional, and it seems that Dell only offers it on the 64 GB models, not 32 GB. In France, the 64 GB HSPA+ option adds €90 to the initial price (€359 instead of €269). The price of the option may vary depending of your country. Be warned that only micro SIM (3FF) format cards are supported by this HSPA+ connector. You'll not be able to fit a mini-SIM (2FF) card into this port without cutting it before, or nano-SIM (4FF) cards without adapter. It can also host, as an input connector, a microphone to record small stuff. Being a combined jack for both input and output, you'll have to use an adapter, or a single-jack micro/headphones combo if you want to record and listen at the same time. The Venue 8 Pro screen comes with an IPS panel, which offers much better vision angles than a TN screen, which (unfortunately) remains the most widespread technology on most laptop computers. This screen is, moreover, one of the brightest of the competition, with a brightness level between 352 and 377 lux (depending of the reviews), a value you'll have to compare against the competition: 204 lux for the Asus Transformer T100, 222 lux and 343 lux for Acer's Iconia W3-810 and W4-820, and 331 lux for the Toshiba Encore WT8. Only the Lenovo Miix 2 8" sports a better score, rated at 534 lux. The contrast level being rated at 1467:1. Open the Charms Bar by swiping your finger from the right side of the screen, then select Settings > Change PC Settings > PC and devices > Power and sleep > disable "Adjust my screen brightness automatically"
Be warned that setting your screen brightness at a high level will lead to shorter battery life. With its 1280x800 pixel, 8-inch panel, giving a 16:10 ratio, this screen remains reasonably good for reading in most situations, without looking too much pixelated, unless you're watching it with a magnifying glass. Its 10-finger, capacitive touch panel allows you to trigger many different shortcuts with your hands, and responsiveness of this touch screen is more than satisfying. It's not an excessively glossy screen either. It can even become matte with a specific screen protection, without losing any quality from the touch panel. Very good point here. This screen provides active stylus support layer, but not for all models: being manufactured by Synaptics, this touch screen will not work with a Wacom stylus, the most popular among all. Which actually narrows your choice options on the Dell official stylus, exclusively (which suffered from severe bugs during the first months of availability, before March 2014), unless you choose to use a capacitive stylus, which performs worst. Screen rotation/orientation will be adjusted automatically, depending of the angle you're holding the tablet with. You'll also notice that the screen orientation process is slower than iOS and Android, but, without being able to check this on other Windows 8 devices, I couldn't tell whether this phenomenon is common to all Windows tablets, or whether it only happens on the Dell Venue 8 Pro. When the first Bay Trail Atom tablets were announced, most people initially thought that performances were going to be weak. Just because of this simple fact: unless very recently, the Atom name was used to reference CPUs made with battery efficiency in mind, not performance. Things are going to change with the Bay Trail generation: the Z3740D unit powering the Venue 8 Pro is a quad-core CPU clocked at 1.33 GHz, which can go up to 1.8 GHz in Turbo mode, when needed. And, surprisingly, despite of its Atom name, this CPU is working well, able to handle all tasks you should ask to perform on a tablet. 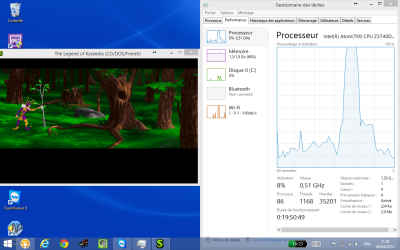 Its GPU is a good helper when it comes to render all transition effects on screen, and play HD videos without hiccups. That said, don't expect to be able to run the latest famous games at maximum detail level, just like you'd do on a PC: experience will not be so good, although I admit it'd be worth trying on a true Windows 8.1 tablet. That said, most titles should be at least playable with minimum details. 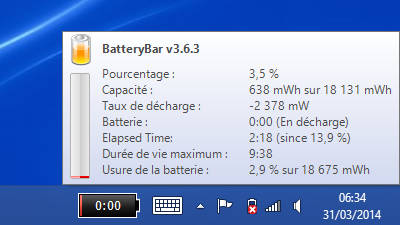 Hopefully, this performance bump does not compromise battery life: power efficiency is still very good. And so is thermal management: without any active cooling system (fans), this tablet never turns hot, only warm, with good temperatures. On the memory side, there's nothing very worth mentioning: just like all other 2013-2014 generation tablets, the Venue 8 Pro comes with 2 GB DDR3L-RS ("Low Current, Self-Refresh") RAM, a memory variant designed with very low power consumption in mind. This memory only fits a single channel here (1 single 2 GB RAM module, no 2 x 1 GB dual-channel mode). It seems that such limitations – speed and channel mode – could be related to the "D" variant of the CPU (Z3740D), unlike other tablets using Z3740 "no D" units, which should be able to handle 2 RAM modules. The 2 GB memory amount complies to current market trends, if you compare the Dell Venue 8 Pro to the competition running Android or iOS. But, if you compare this with any traditional PC from these last years, which would usually come with at least 4 GB RAM, this memory amount could appear quite weak. Unlike Android or iOS tablets, where you're not usually running more than a single fullscreen app at a time, Windows 8.1 allows you to run several applications at the same time, as background tasks or main apps in a multitasking environment (including several side-by-side applications), and you're still asked to close any unused applications yourself. Which can quickly lead to high memory needs. But if you're mainly using the Venue 8 Pro as a content consumption device (reading multimedia files, browsing the Web, office work...) without heavily relying on multitasking, you shouldn't feel stuck with such memory amount. 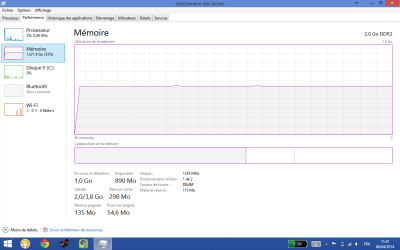 Above is a screenshot from the Windows Task Manager, reporting RAM usage on an idle Windows session, with only a few apps running in the background. 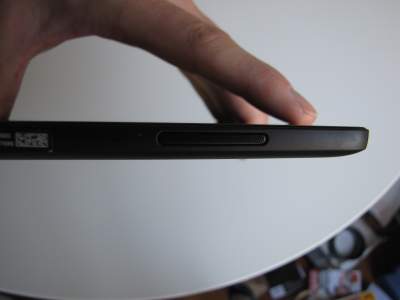 The internal storage capacity of the Dell Venue 8 Pro is either 32 or 64 GB, depending of the model you choose. This storage space is handled by flash eMMC memory. Compared to Windows PCs, even those only powered by a SSD, this capacity may appear quite small. But, once again, if you compare with the other tablets on the market, which usually come with 8 to 32 GB storage space, the Dell Venue 8 Pro offers more than the average of the competition. 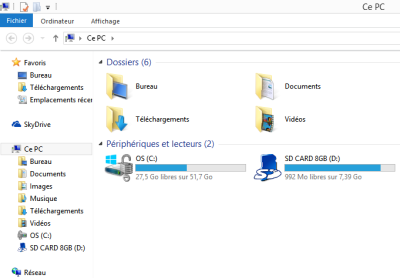 That said, a Windows 8.1 tablet requires more storage space, as the Windows (non-RT) system has much more requirements on this particular point, than other tablet operating systems. on the 64 GB version, the available space is 38 GB under the same conditions. Hopefully, there are some tips and tricks you can apply to free some gigabytes of disk space, by moving the recovery partition on a different USB disk, or by uninstalling some applications initially bundled with the tablet. At such, I'll deliver the same comment than with RAM usage here: if you're using your tablet to view some data without installing too much software games, it should be enough to fit your needs... if you get the 64 GB variant of the Venue 8, at least. On the performance chart (read/write speeds, access times), the eMMC memory used on the Venue 8 Pro and its competitors is half-way between conventional memory cards, and entry-level SSDs. 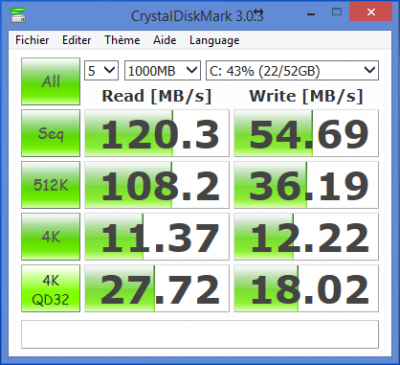 In real life, the Venue 8 Pro CrystalDiskMark results are reporting sequential read speeds of 68 MB per second, and 33 MB per second write speeds. These rates are somewhat those you can observe on USB 3.0 entry-level flash USB drives (like the Kingston DataTraveler R3.0). These rates are those you can get with the "DDR50" memory management mode, enabled by default on BIOS revisions A04 and earlier. By enabling the "HS200" option (unavailable in revision A04, enabled by default in A05 revision), you'll get a welcome speed bump, with 120 MB/second sequential read speed, and 55 MB writing rate! The impact of this mode on the tablet's battery life and flash memory's health should be minor compared to what you gain in performance. Might it be why it has been enabled by default on new BIOS revisions? There's a similar mode for the card reader, but, unlike internal eMMC memory, performance gain remains restricted (and will mostly depend of the memory card's quality), while the impact on its health is likely to be more important. As a result, this option isn't available on all BIOS revisions. Overall, we are quite far from the performance rates of a PC SSD, even an entry-level model, and far away from high-end tablet's SSDs (like the Microsoft Surface Pro). 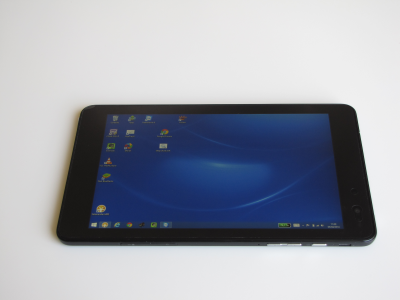 But it remains quite good for a tablet at this price, and often sufficient in non-heavy use. When inserting a memory card in the microSD slot, it is directly recognized by Windows, with its own drive letter, just like with any other USB card reader you'd use on a PC. Performances from this storage medium will be heavily dependent of the memory card you'll be using, although the card reader of the Venue 8 Pro could also bring its own limit towards transfer rates. 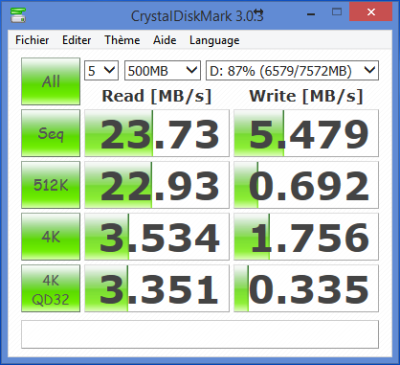 On CrystalDiskMark, a SanDisk 8 GB Class 4 (filled up to 87%) gives transfer rates of 23.7 MB/second (read) and 5.4 MB/second (write). Rates which actually match those expected for a class 4 SD card. Logically, you'll thus prefer using SD card storage only to store static data, or a few Windows Desktop applications not requiring much performance. On a such-sized device, you'll not expect to find a gaming graphics card: here, you'll only find an integrated Intel HD Graphics chipset, Bay Trail generation (without any matching number), which is actually a crippled-down version of the Intel HD Graphics 4000 series. The Intel HD Graphics Bay Trail GPU from the Dell Venue 8 Pro is approximately 4 times less powerful than the "full" Intel HD Graphics 4000 chipset it's based on, a chipset you can find, say, on 2013-generation ultrabooks. Given that the performance of these 4000 series is, itself, roughly equivalent to the performance of a 7/8 years old dedicated graphics card, like the NVIDIA 7600 GT/8600 GT or ATI X800 XT/X1650 XT series, imagine now what could be this processing process divided by 4, and you'll obtain (approximately) the performance index of the Dell Venue 8 Pro's GPU. 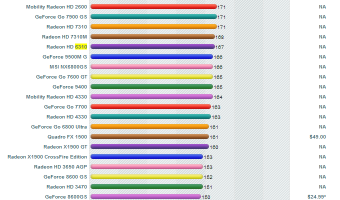 If you compare this chipset to the competition, it would be an equivalent of an AMD Radeon HD 6310 integrated GPU; what you can read on NotebookCheck's review or VideoCardBenchmark.net's chart. In real life, you'll have to put these results in perspective: for multimedia use, this GPU, along with the CPU, will be more than able to decode Full HD 1080p videos in Blu-ray quality without any hassle. And so will be any task outside heavy 3D processing (modeling, games). The HD Graphics GPU requires a small part of the system RAM to work, like any other GPU integrated into the CPU or motherboard. 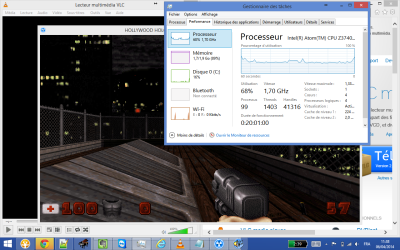 By default, the GPU seems to use 105 MB of memory; it can use up to 1 GB when needed, like when playing games. This memory allocation is automatically managed by the system. To measure the performance of this tablet on your favorite games, you'll have to know how much performance you'll want to consider a game to be "playable" on it; some people will not consider a game to be playable below 30 FPS, or with below-average detail levels. If you're willing to accept some restrictions on your video game settings to play them on the Dell Venue 8 Pro, you should actually appreciate what you'll get. Not surprisingly, all these titles run perfectly on the Dell Venue 8 Pro, without any compromise on graphics quality or smoothness. Rather logical for games released more than 15 years ago, even in "remastered" editions. Regarding more recent titles, many reviews and tests have been made from players all around the world, on this particular tablet or its competitors based on the same hardware (like the Asus Transformer T100). 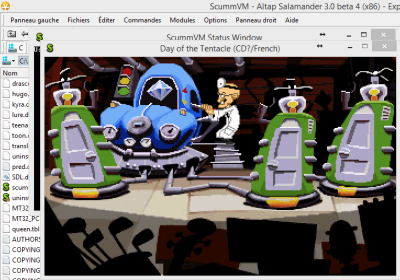 Pierre Lecourt, founder of the famous French Blogeee and MiniMachines.net websites, released many reviews of games running on the Asus T100. 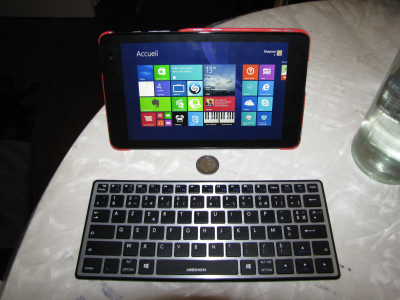 For more information, I strongly encourage you to check Pierre Lecourt's excellent Asus Transformer T100 review and his gaming videos (in French). Like most smartphones nowadays, the Dell Venue 8 Pro offers two cameras: a front 1.2 megapixel camera for your videoconferencing needs, and a rear 5 megapixel camera. Like stated on the user's manual, the rear camera comes with an autofocus, which is actually rather fast. The Photo application of Windows 8.1 is quite responsive and provides a preview of the photo you just took, as soon as you tap on the shutter. I should also mention that the preview function renders quite fast on screen, and seems above average in my opinion, especially in low light conditions: moving the device in a very dark room does not always lead to such smooth results on numerous cameras. Both camera sensors support HD 720p video capture (1280x720 pixel resolution). To measure the photo quality of the two Venue 8 Pro cameras, I asked Mr. "Screen cleaner plush duck" from Pearl, to participate in the photo shooting. I shoot my old pal with the two tablet cameras first, and did the same operation once again with my smartphone, a Sony Xperia Pro, mid-range smartphone released in 2011, which came with a 8-megapixel rear camera, on which I disabled the flash. On these photo series, you'll find that the Venue 8 Pro's rear camera produces more noise than the Sony Xperia Pro, which was, granted, better than the average competition at its time, but already nearly 3 years old. Colors also look more natural on photos from this phone, than on those from the Dell tablet, which deliver shots looking rather "bland" and "washed". When comparing the front cameras of the two devices, however, the Dell Venue 8 Pro offer much better results than the Sony Xperia Pro. While most smartphone front cameras are usually below average, Dell made some efforts to avoid this by choosing an above-average front camera, which should deliver reasonable results when used for HD videoconferencing, rather than shooting photos. There's no flash on any of the two cameras of the Venue 8 Pro. As a result, taking photos in low light, dark rooms will often be difficult. Here are, this time, some photos taken during the evening, in a room powered with an artificial light source, with the rear cameras from each test device. In low light conditions, the Dell Venue 8 Pro seems to be out of luck; to reduce noise, the tablet applies some visible processing on all the shots, which thus look slightly blurry. In the same situation, the Sony Xperia Pro renders a much better result, with better-defined photos, and a much better noise management. If we had the choice, there's no doubt we would have preferred to get the photos without this automated blurry filtering, and eventually apply such a filter from some photo-editing software afterwards. But with good lighting conditions, both cameras from the Dell Venue 8 Pro should perform correctly for most basic needs. The sound output from this tablet comes from a small mono speaker located on the bottom side of the tablet (when looking in Portrait mode). This one sounds surprisingly loud for its tiny size, and if you'll obviously not fill a large room with its sound, it should be more than handy to watch videos, without any distortion, even at high levels. A very good surprise here! The only problem being, in my opinion, the fact that this speaker is the only one provided on the tablet. When used in Landscape mode, you'll clearly notice than the sound comes from a single side of the tablet, which can be rather disturbing for your listening comfort. This fact does not really apply when the tablet is used in Portrait mode. To make it clear, a second speaker of the same quality on the upper side of the tablet would have been perfect to get a good sound stereo image. Hopefully, the headphones output from this tablet does not lead to any criticism. The rendering of the sound is very clean, without any noisy interferences. 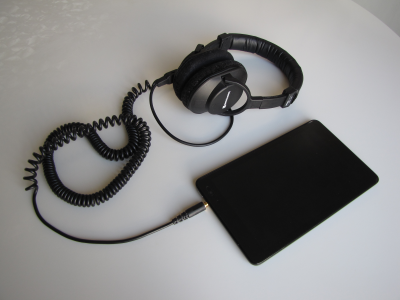 Tested with two Sennheiser HD-25-1-II and BeyerDynamic DT700 headphones, the tablet provides enough electrical supply to power them correctly and get a good listening volume level. Of course, being a tablet with an integrated audio chipset, its capabilities will sound rather limited if you plan to use this tablet for audio production purposes (with a DAW), requiring ASIO drivers, or working with VST(i) plug-ins and other elements requiring a dedicated soundcard with minimum latency. If you need so, your only available option will be to get a USB soundcard, and, most important, a model which can be powered with its own electrical supply, the Dell Venue 8 Pro being likely to fail at powering such devices. The Dell Venue 8 Pro offers two or three wireless network technologies: Wi-Fi (802.11n 2x2 MIMO), Bluetooth (4.0) and HSPA+ through a micro-SIM card (if you ordered your tablet with this option). To maximize battery life, and even more in sleep mode, these three wireless technologies can be disabled anytime from the Charms bar, either by using the Airplane mode (which disables all three) or by disabling each technology separately. The Dell Venue 8 Pro provides Wi-Fi through a Dell Wireless 1538 card, which supports 802.11 standard in a, b, g and n versions, which can go up to 450 Mbps. This card is dual band 2x2 MIMO capable, supporting 2.4 GHz and 5 GHz frequencies. You'll thus be able to connect to more networks, or use an alternate band at home to prevent interferences with other electrical equipment. In real life, the differences can be spotted when compared to another single band device: more than once, the tablet detected more Wi-Fi hotspots, with better signal, than my Sony Xperia Pro smartphone. Back when the tablet was released, Dell had to struggle with many issues related to Wi-Fi, just like complete connectivity loss after putting the tablet into sleep or Airplane modes, with no other choice than rebooting the tablet to restore wireless connections! These bugs still sometimes appear on my own tablet in March 2014. Let's hope that the situation will soon be better thanks to future updates! 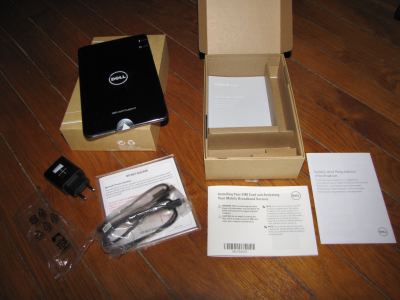 As a buy-to-order option, and only on the 64 GB model as far as I know, the Dell Venue 8 Pro can be equipped with an HSPA+ Dell Wireless 5570 card, which can host a micro-SIM phone card, like those from many smartphones, so you can use a phone data plan to access the Internet in places without Wi-Fi access, just like you'd do with your telephone. I insist on the fact that only the micro SIM (3FF) format is supported. If you currently use a mini-SIM (original format, known as 2FF, widely spread, until micro SIM started to emerge on smartphones), you'll have to cutoff your card to insert it into the V8P. And if you're using a nano SIM card (4FF: iPhone 5, Nokia Lumia 1520), you'll have to get another SIM card; there are some nano SIM to micro SIM adapters available, but these ones can permanently damage the port's contacts if the product is poorly designed. So, be careful! By default, the micro SIM slot is enabled on the tablet, even if no card has been inserted into it. Although I don't really know if it can really have an impact on the overall battery life, I recommend you to disable this module (from the Charms bar) if your tablet offers one, and if you don't use it at the moment. This technology also allows you to connect the tablet to other devices (such as cellular phones or computers) to transfer and receive files, directly, without any additional hardware requirement (such as a router), but with slower speeds than Wi-Fi, and narrower network coverage. Bluetooth version 4.0 brings reduced power consumption over previous versions, an essential point for a tablet. 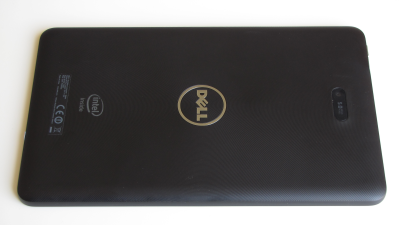 The Dell Venue 8 Pro comes with a non-removable, 2-cell Lithium-ion battery which has a capacity of 18 675 mWh (4830 mAh). This capacity may appear rather weak compared to those you can find on laptop PCs (between 3 and 9 cells), but it's actually above the average capacity of most similar-sized tablets. For comparison purposes, the Nexus 7 has a 4325 mAh battery (3950 on a 2013 version), the non-Retina iPad Mini has 4490 mAh, and a Galaxy Tab 8.0 has 4450 mAh. Dell announces 9.9 hours of battery life for the Venue 8 Pro. This value needs to be proven in real-life use. You can actually get close to it, and even reach it, if you take care to set an appropriate screen brightness level, close unused applications, and disable unneeded sensors. An average battery life value would be approximately 7 hours and a half, using the tablet continuously. ipro.co.uk measured 10h34m of continuous video playback; 2013 Nexus 7 reached 12h, and 2012 iPad Air reached 12h40m, with brightness level at 75% and disabled wireless networks. NotebookCheck measured a battery life of 6h13m in continuous Wi-Fi usage, compared to 6h41m for the 2013 Nexus 7 and 12h (!) for the 1st-gen iPad Mini. UMPCPortal reached an 8-hour battery life in mixed use with brightness set at 35%. 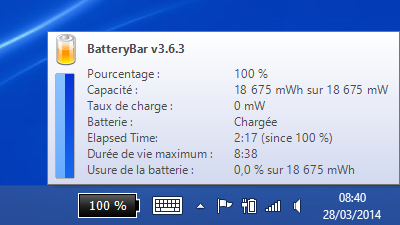 These values are rather high for a Windows device using such a little battery, moreover sold within this price range, although most iOS or Android tablets usually get better scores. However, we need to highlight Intel's nice work on the Bay Trail platform, which is the first one in their product history to offer reasonable tablet battery life, compared to the previous generations of Windows tablets who were quite weak on this point. Discharge rate, in light usage, is 40 mW per minute (4 mW every 6 seconds). At these rates, the 18 675 mWh count of the brand-new battery would be theoretically empty after 466 minutes and 52 seconds, or 7 hours and 46 minutes, which sounds close to results you can find on other Internet reviews. In connected standby, the Venue 8 Pro eats about 1% battery every 4 hours; according to my own tests and calculations, the sleep/standby battery life of the Venue 8 Pro should be nearly 6 days. Results which may sound correct at first, but which are actually lower than Android tablets, and even more lower than Apple's iOS tablets, who promotes a blasting 30-day (720 hours) standby battery life for the iPad line. 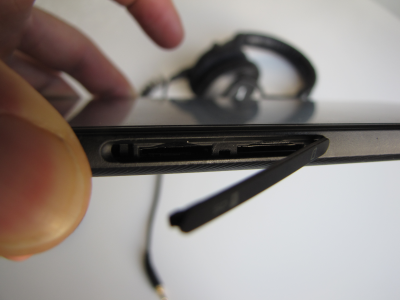 Some user feedback mentioned that their tablet was discharging faster when the active Dell stylus was located near the tablet. I didn't experience this on my side; I always put the stylus in a separate pocket from the tablet itself, although both are not that far from each other. Charging can only be done through the only tablet's USB port, which prevents you from using USB devices while you're charging the tablet. You'll also have to notice that you can't charge the tablet by plugging it on a computer's USB port, no matter being USB 2.0 and 3.0. All other 8-inch Bay Trail tablets actually suffer from this exact same limitation; as a result, it may be a limitation of Intel's platform itself. You can however buy some additional (and complex) wired solution, consisting of several adapters and cables, if you need to recharge the tablet while using a USB device. This cabling, not really portable, should be thus dedicated to home usage only. The recharge rate, with an always-on screen set with maximum brightness, using Dell's bundled AC adapter (2 A), is 33% in 2 hours, and, as such, you'll need 6 hours to completely charge it. An amount of time which can be heavily reduced simply by turning the screen off (sleep) and disabling wireless network adapters. The Dell Venue 8 Pro, like most tablets on the market, does not use any active (fan) cooling system, and only relies on passive cooling. In real usage, the tablet seems to handle heating properly, as you can only observe a small warm spot in the upper-right hand corner (behind the front camera), after rather intensive use (games), and it never reaches any critical level. Which remains excellent, even more when compared to an aluminum tablet like the iPad, which immediately redirects any heat to the outside of the tablet... reaching your hands more than easily! 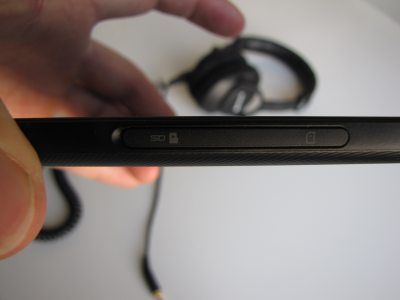 Unfortunately, the Dell Venue 8 Pro does not provide dedicated HDMI video output. If you want to use an external monitor or TV with this tablet, you'll have to choose between two alternative solutions. 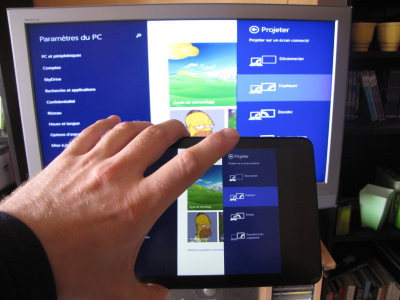 a wireless connection, thanks to Miracast technology, natively supported by the tablet (and Windows 8.1), if you already own a Miracast-compatible display device (notably a TV). This technology is similar to Apple's AirPlay, in a "standardized" version, managed by the Wi-Fi Alliance; through your Wi-Fi network, it can transfer both audio and video from an source device (the tablet) to a target receiver device (TV or other display device). Miracast wireless connection can be the easiest to setup if your Miracast receiver (compatible TV, specialized adapter...) is compatible with the Venue 8 Pro. But if it's not the case, be prepared to face several issues related to drivers, bugs, slow or intermittent display... which can be difficult to diagnose. 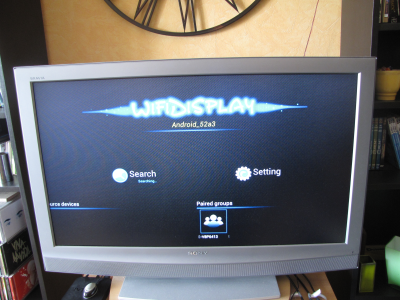 If you don't own any Miracast-compatible device, you can purchase a Miracast-compatible adapter, which you'll then connect, through a wired connection (usually, an HDMI cable) on a standard display (computer monitor or TV). 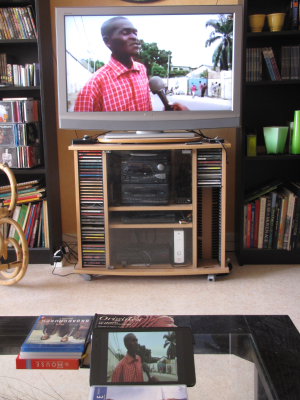 I chose this solution to extend the display of the Venue 8 Pro to a non-Miracast compatible TV. I selected, for this purpose, an Android-powered mini-PC, the NEO X5 from MINIX, which, after applying an operating system update ("Jelly Bean" 4.2 version), added support for Miracast, through a dedicated application named "WifiDisplay". 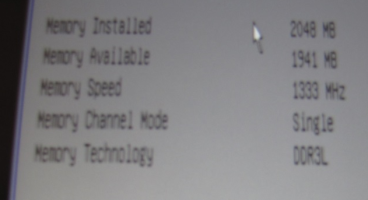 from the Venue 8 Pro, toggle the Charms Bar, then select Devices > Project > Add a wireless display. The MINIX NEO X5 is then detected as a wireless display; you'll then have to tap on it, follow the pairing procedures, and voilà, your tablet's display is cloned on your external display! 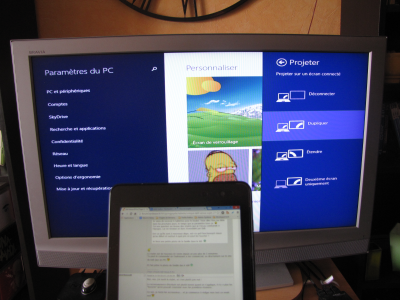 Until very recently, Miracast wasn't working in "Mirror" mode (exact copy of the tablet's screen contents on the external display), but only in Extended Desktop mode. Such situation was caused by a bug in Windows 8.1 preventing a Portrait-orientable device from being displayed on a Landscape-orientation monitor. This bug has been since fixed by Microsoft. displaying an extended desktop on the second monitor; but this setup requires an external keyboard and mouse combo, as you can't transpose, obviously, your finger taps from the tablet's screen to the external display! The only drawback of my Miracast solution (and many other Miracast/DisplayLink adapters) is... the price. 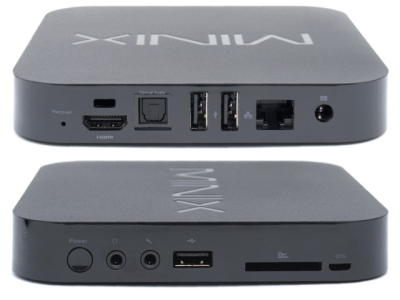 I had to spend €109 for the MINIX NEO X5. A rather high price if you only intend to use it as a Miracast adapter; but if, like me, you're willing to use it for other purposes (unleashing the full potential of a true Android environment on your TV, to read videos, listen to music, play games...), this investment will soon be worth it. There are many Miracast (and DisplayLink) adapters on the market, available within all price ranges. The Netgear Push4TV PTV3000 Miracast adapter is one of the most popular available, but it can also lead to some erratic behavior and issues, like those described above. 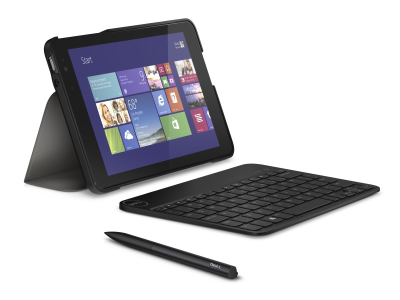 The Dell Venue 8 Pro comes with a Synaptics stylus-enabled touchscreen technology. 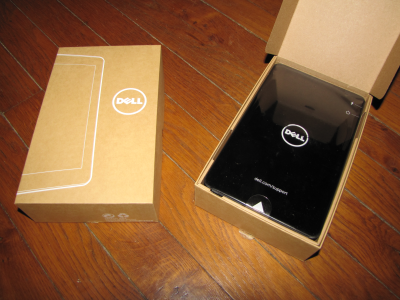 This technology enabled to use an "active" stylus with this tablet, which you can purchase separately from Dell. 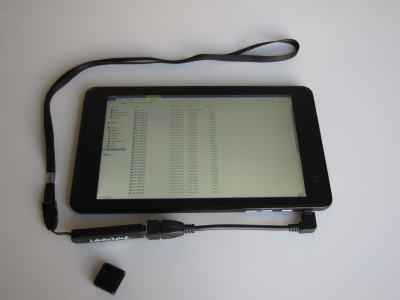 An "active" stylus (or "digitizer"), compared to a standard stylus known as "capacitive", sports some embedded electronics, so the tablet can detect it properly and react accordingly. A capacitive stylus does not integrate any electronics, and, thus, is nothing more than a bare "pencil" with a specific tip, simulating your finger's electrical conduction process, so they can work with touchscreens also known as "capacitive" (like all those from smartphones and tablets released these last years). With this kind of stylus, you'll thus not be able to execute other actions than those you'd usually trigger with your finger, except for added precision (the stylus' tip being thinner than your fingers, it can help you selecting very small elements from screen, like those from the Windows 8 Classic Desktop, on the small Venue 8 Pro 8" screen). an active stylus can also feature physical buttons, allowing you to trigger some additional actions (like simulating an eraser on drawing software to clear previously drawn lines). The active stylus designed by Dell for the Venue 8 Pro comes with 256-level pressure detection, dual customizable button, palm detection/rejection and screen hovering, and requires an AAAA battery (LR-61) to work. The Dell stylus sports an appealing, discrete design, closer to a real pen, and doesn't look like an electronic gadget. It's feeling nice in hands, not too thin or too thick, and the battery's weight is barely noticeable. However, its lightweight plastic body makes it rather fragile (you'll have to be careful and avoid tramping or sitting on it...) and slippery (a grip would have been perfect). 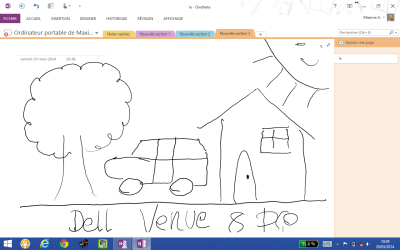 Dell's choice of Synaptics technology led to many negative feedback following the release of the Venue 8 Pro. Dell reacted by publishing several driver and firmware updates for the tablet or the system itself, and issued a massive recall of the first stylus revisions (known as "A00") to fix hardware issues which couldn't be addressed through software updates. This led to a massive shortage of styli during most of Q1 2014. 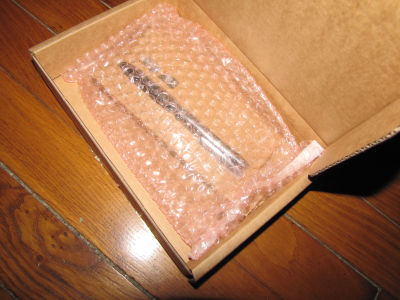 In March 2014, new styli, in "A01" revision, were released and made available for purchase, and were said to address most of the biggest issues encountered with the first revisions. The Dell Venue 8 Pro being my first own tablet, and the very first one on which I could experiment with a stylus, I don't have enough experience to compare this Synaptics stylus with other brands used on other stylus-enabled tablets, such as the Asus VivoTab Note 8 or Microsoft Surface tablets, featuring the most renowned (and objectively better) Wacom technology. As a result, I'm going to give my opinion from two different angles: first as a stylus newbie, without any comparison points or knowledge of competing technology; then, I'll temper my expectations with feedback from other users who actually compared with competition. You'll also note that I'm left-handled; as such, I configured the stylus for left-handed operation. the palm is often accurately detected, as well as elements' hovering on Windows (which comes in handy to display tooltips or drop-down menus on the Internet, which can't be used in a touch environment if nothing has been designed for that purpose). the battery life remains the most unknown factor. If the bundled battery actually lasts you several months, replacing it will not be a major issue for you; but if you got a battery which dies after a few days use, you'll suffer from its rare shape, harder to find on stores, more expensive and almost impossible to get in a rechargeable variant. Which could lead you to ultimately stop using it. at least, with a battery-free stylus, Wacom has made a giant leap forward, avoiding you to change it for a pricey battery. As a side note, you'll notice that this battery-free technology is patented from Wacom, relying on electromagnetic radiation to transfer electrical current from the tablet to the stylus. The Asus VivoTab Note 8 is the only Windows 8-inch tablet to be equipped with a Wacom active stylus/digitizer, as of Q1 2014. But this product does not benefit from some features advertised by Dell, such as HSPA+ connectivity. So, everybody will have to choose between these two, depending on each people's requirements. The Dell Venue 8 Pro is part of a new generation of tablets, inaugurated by the Acer Iconia W3-810: the sub-10" Windows 8 tablet generation. A new tablet generation which, for the first time, can provide a really usable Windows PC experience in your pocket, with totally fanless and unrestricted features experience, with an operating system made for both tablets and computers, not only one of them. 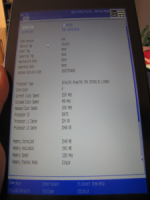 A tablet with an operating system which can't reach (yet) the very high battery life of the competing systems, but which offers the largest software library available, if you consider its "Windows computer" capabilities. Because, if the Windows Store software library is still young - and lacking many applications you can find on the Apple Store or Google Play Store for Android - you should never forget that your tablet is running a full Windows 8.1 here, and not Windows RT - hence, the very same Windows you can have on any other PC. Which allows you to install, along with the applications from the Windows Store, millions of applications made for Windows - the very same ones you can already install on other computers, either being games or specific business applications - but, also, any other USB device, even the most exotic one, provided it comes with its own power source and recent Windows drivers. And if you consider, moreover, that there's some software like BlueStacks, which allows you to run Android software on a Windows PC, Windows 8.1 tablets like the Dell Venue 8 Pro don't really miss something compared to the competition. Moreover, the Dell Venue 8 Pro has been made and designed like any other tablet: robust, nicely built and energy-efficient, able to follow you everywhere you'll go thanks to its small size - an ideal choice sitting between a compact 7" and an easier-to-use 10", its ability to wake up from sleep in less than a second and remain in connected standby during several days, to fulfill all your business needs while on-the-go, or any entertainment purposes while laying on your sofa. 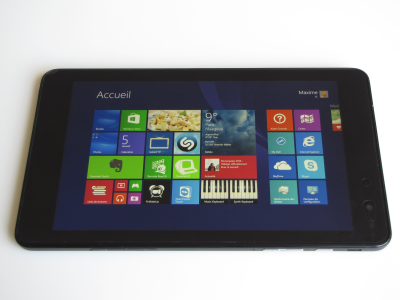 This tablet represents the end of a several-year struggle, from Microsoft and manufacturers, towards the Windows experience on a touchscreen tablet. An affordable product – starting at €269 or $299 for the 32 GB version, it will be a great contender in your wish-list if you're looking for a sub-10" tablet, without being afraid of being stuck on a system which only allows you to run applications from its own store (iOS, Android, Windows RT), on which you'll moreover be able to connect all your devices. Of course, Dell could have done better on some points; notable hit-and-miss features include the lack of a micro-HDMI output, the inability to recharge the tablet while connecting a device on the USB port, the perfectible stylus technology, and some issues related to sleep or Wi-Fi connectivity. In the meantime, let's hope that these issues will be corrected with a future revision of the tablet, or a future product from the competition. Competing products which are also worth looking, but not perfect as well. Choosing the right one is up to you now! On a personal side, I'm very happy with this tablet, my first own one. A tablet I've been waiting for a long time, and it shows: the Dell Venue 8 Pro avoids all the compromises and limitations I had to face when using Android or iOS tablets at work. 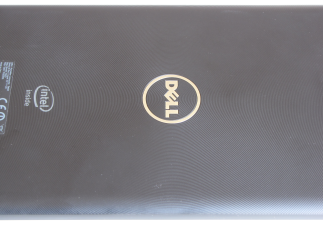 The Dell Venue 8 Pro is a great companion device to go with my heavyweight laptop, with a limited financial impact. A companion which already follows me everywhere, and will continue to do so as long as it'll prove to be reliable!